Description: BN GM/EMD SD40-2 6332, an ATSF GM/EMD SD45-2 and a BNSF ex BN Patched GM/EMD GP40M with an Eastbound BNSF Intermodal/stack train, West of the Crossovers. Description: BNSF Westbound Ballast Train passing through Taiban, NM. Description: Northtown to Superior manifest running late, in the evening light. Description: A variety of yard power sits next to the office. Description: Two Geeps bring some hoppers through downtown Jamestown. Description: After shoving off the P-Line onto the Prosper sub, they cross over the HWY 10 bridge and are about to enter the KO sub and head for the yard. Description: Elder statesman - ex CBQ GP40 - 1/2 the North Local power set. 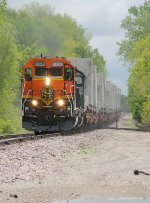 Description: it may be a backlit blurred shot but when was the last time you saw ANY BNSF SD60M's out on the main line? they are shoving there train into the yard at "Interstate". Description: Two 45 year old former CB&Q GP40s notch it up as they come through University on the BN-UP. Description: A pair of former CB&Q GP40s, that are now pushing 45 years old, are seen here on the BN-UP Transfer coming through University. Description: Heading west with 15 cars of concrete fuel casks for Xcel Energy in Monticello. Description: After getting up to Albertville, the Monti starts to slowly creep along the rarely used section of track up to Monticello. Description: A train of casks for spent nuclear fuel rods starts its trip up to towards Monticello as it departs from Northtown Yard. First move like this in 30 years! 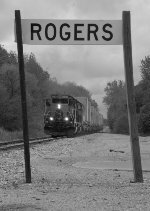 Description: Using everybit of my 270mm lens, I shot this through the station sign at Rogers as the train load of casks came rolling up to Rogers. Description: While track speed is 25 mph, chasing the Monti Local can be fairly difficult thanks to stop lights along the way. Here the Monti Local rolls through Rogers; I had barely any time to get to the tracks a set up for this shot from Dayton, MN. Description: The hi-rail inspector is seen here ahead of the train. This special train would tie down about another mile from this location. The hi-railer would go all the way into Monticello, inspecting the track. Description: Special delivery for Xcel Energy in Monticello and is seen here crossing over Interstate 94 east of Rogers. Description: Special Agents along with Wright County Sheriff's Office help protect railroad crossings. All the crossings are exempt in Monticello and require flagging at all of them. Officials from Xcel Energy also look on as their shipment is just about on their property. Description: Special delivery for Xcel Energy and is in downtown Monticello. Description: The BNSF is nearing the end of its journey and will shove the loads into Xcel Energy Nuclear Plant (pictured on the right). Description: Employees flag the State Hwy 25 crossing before the train will be able to pass. Description: The closest a person will ever see to a meet in Monticello. Description: We have a problem... The train was too long for the "siding" at Monticello, so they had too cut the power off and run a GP to the other end so they make enough room for the 2 mile shove up to Xcel Energy. Description: After getting the all-clear from Xcel, they shove the loads into the plant. This would be the last spot to take photos as Xcel's property is just infront of where I am standing and they dont take kindness to any unregistered visitors near their property. Description: Special delivery for Xcel Energy. 15 cars of concrete fuel casks are being brought up to the Monticello Nuclear Generating Plant. These moves are highly rare. This is the first train that the City of Monticello has seen in about a year. Description: With the second GP added, they will shove 2 miles to the plant and set out the delivery. Description: Stopped on the main and waiting for the all clear from Xcel Energy to proceed into the plant.